Breast cancer is the most commonly diagnosed cancer (excluding non-melanoma skin cancer) and the leading cause of cancer deaths among women in the U.S. One in eight women will be diagnosed with breast cancer at some point in their lives. The good news is that the five-year relative survival rate is ninety-eight percent if the cancer is detected at its earliest stage, when it’s most curable. Early detection is critical to successful treatment and survival. 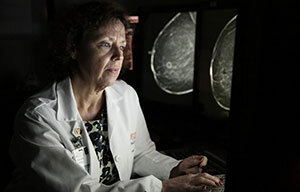 An untiring dedication and commitment to women’s breast health—this is what women and their families in Virginia can expect when they seek out breast care services at the University of Virginia’s Division of Breast Imaging. Our dedicated team of physicians, nurses, and technologists provide patients with a comprehensive, high quality, and individually tailored evaluation for early detection and diagnosis of breast disease. Our Breast Care Center is the only facility in Virginia combining surgery and breast imaging. And unlike many other facilities, radiologists in our Breast Care Center work exclusively with breast imaging—rendering a quality of care unmatched in the area. The Division is fully equipped with the latest technology, offering the full range of breast cancer screening procedures and services: clinical consultation, screening and diagnostic mammography, tomosynthesis, breast ultrasound, breast MRI, galactography, and image-guided interventional procedures. Core biopsies are performed under ultrasound, stereotactic, and MRI guidance. Digital mammography services are also available. We perform approximately 17,000 mammograms, 2,500 breast ultrasounds, and 800 interventional breast procedures per year at three locations. Coordinated through the UVA Cancer Center (a National Cancer Institute Designated Cancer Center), the University of Virginia also has a mobile mammography coach that can perform screening mammograms at worksites and outlying community locations. Our division is working to help develop an innovative new breast cancer screening model (incorporating “breast density” into the risk factor calculation). In the next five to six years, this advanced new model is expected to become the national standard in breast cancer screening.